If the LG dishwasher is displaying the FE error code, it means a filling problem is detected, so the pump is turning on and draining the water. The failure of the leak protection system. A body breach, a hose/pipe seal failure. The worn drain pump seal. If the installation is proper. Inspect whether the hoses are secured firmly or whether there’s a leak. If the door is closed tightly. In order to avoid an accident, the appliance will constantly drain the water even if there is a small gap. Close the door tight. Still, there is a thing to do before you start searching for the causes of the FE error code in the LG dishwasher. First, you need to eliminate the software failure of the control board. In order to do this, unplug the LG dishwasher for 10-15 minutes, and then turn it back on. If the error is still there, then proceed with the troubleshooting. The Aquastop system is integrated into the majority of modern LG dishwashers. It protects the user from an emergency caused by water leaks. So when the bottom panel gets some water, the foam float rises and activates the switch. The switch sends a signal to the electronic module, and the latter – to the drain pump. The water is drained then. Because of the malfunctioning Aquastop, the system will show the F E error code on the LG dishwasher display. The wrong activation may be caused by the scale on the float. install the new part in reverse order. 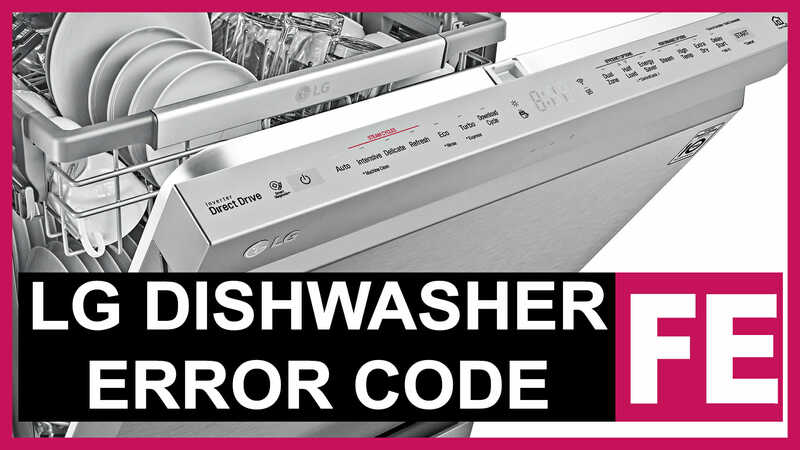 The code may also appear on the LG dishwasher display because of the improper inlet valve and the level sensor cooperation. The pressure switch sends information to the board about the amount of water in the tub. If the information provided is wrong, the system will get water and drain water when you turn on the appliance. The inlet solenoid valve has a membrane. When power is off, the membrane closes the path, but as soon as the valve receives an impulse, the barrier opens and the water fills in. Either mechanical or electronic part may be faulty. inspect the valve for a clog. The element is beyond repair so replace it with the original spare part in case of failure. The pressure switch can be located under the bottom of the appliance. The part is a tank to which the pressure tubes are connected. You can make sure the sensor is working properly by using a multimeter or blowing into the tube. Can you hear anything clicking? Then the part is all right. If not, replace it. A short circuit or a power surge. Have you installed the dishwasher without a voltage regulator? There is a risk of the electronic parts to malfunction. Moisture penetration. The water may enter the module when you transport the appliance. It is not the main reason for the FE fault to occur in the LG dishwasher. Still, if you have ruled out all the others, then it remains to check the circulation pump. The motor supplies the water to the spray arms steadily, which makes the dishes clean. Unfortunately, you cannot replace just the seal if worn. There is no individual supply of the parts, and the pump (in most models) is not dismountable. remove the part from the body and install a new one. Also carefully inspect the pipes for being intact. If they are leaky or loose, you’d better install new pipes. The dishwasher damaged tub may leak as well. In this case, the bottom panel will constantly overflow. If the error code does not disappear and you can not find the cause, then you need a specialist to examine the device.